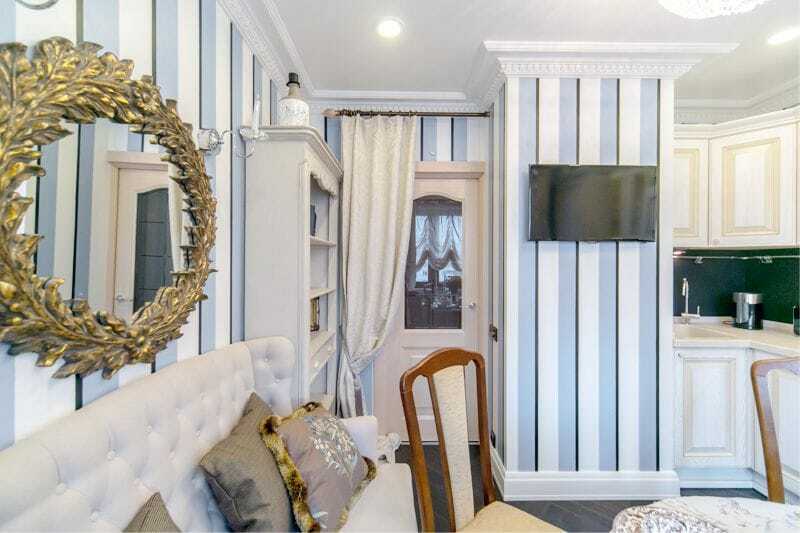 In this material, we will consider in detail all these variants of planning except for double-row, as it is more suitable in the arrangement of narrow and elongated kitchens , rather than square ones. 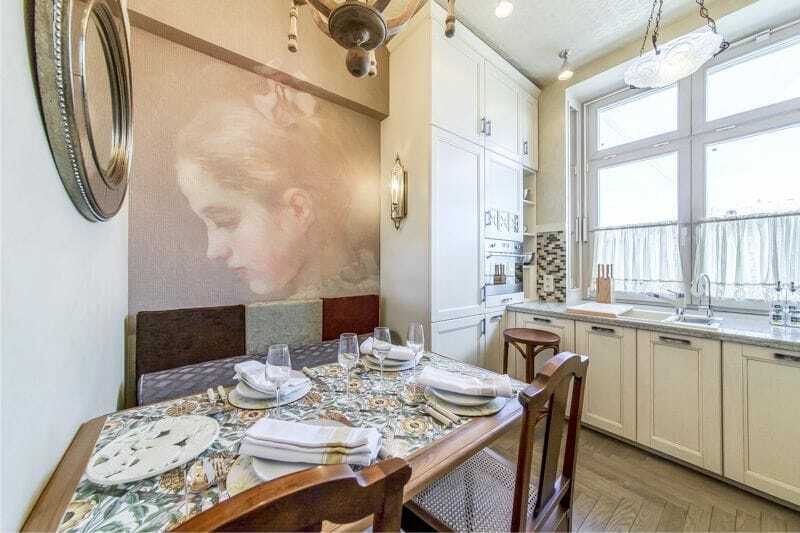 This implies the arrangement of kitchen cabinets along one wall, whereas the dining table is placed opposite the headset or closer to the window. Pros: A set built in one line is compact, simple and versatile. 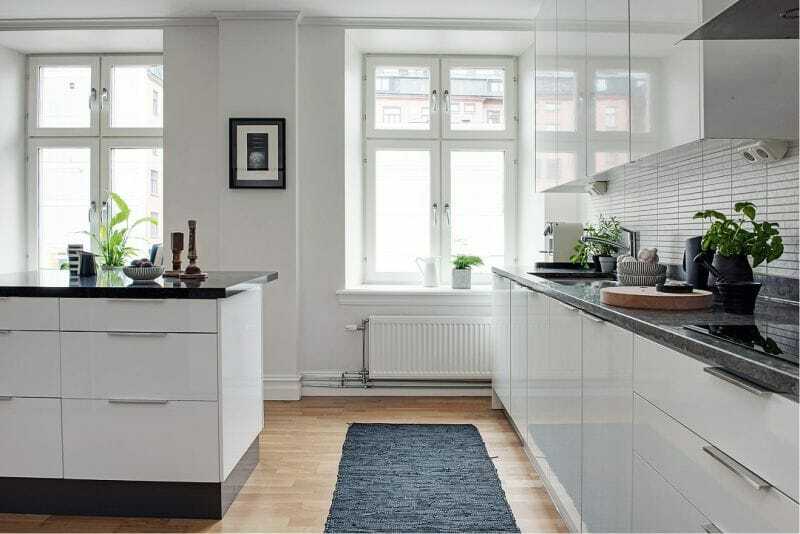 Cons: Building three working points – a stove, a sink and a refrigerator in one row can make working in the kitchen hectic. Be prepared for frequent rushes back and forth during cooking. Hint: A suite with an additional third tier or an enlarged second tier will allow you to store more items, as well as hide the air duct. 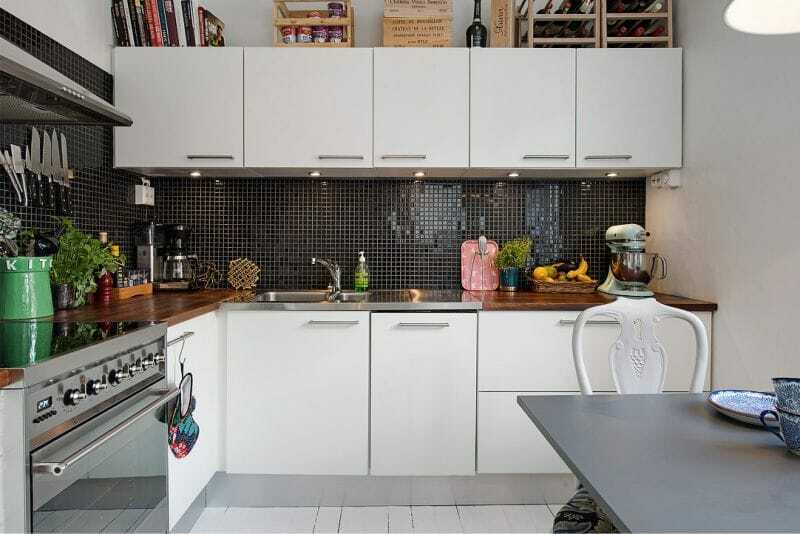 The L-shaped layout – a win-win option for any square kitchen – both small and large. 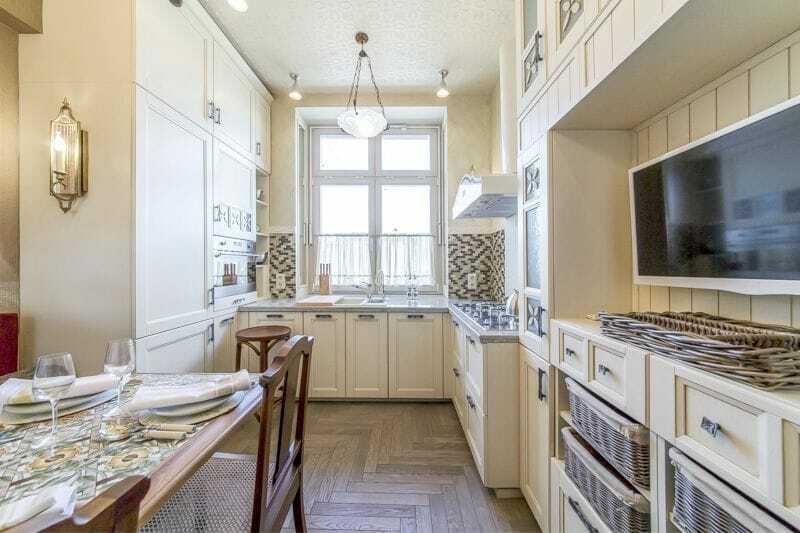 Pros: The corner kitchen is a great concept because it involves two walls and an angle between them, which makes it possible to arrange a stove, sink and refrigerator, based on the principle of a “working triangle”, while leaving enough room for the dining area. 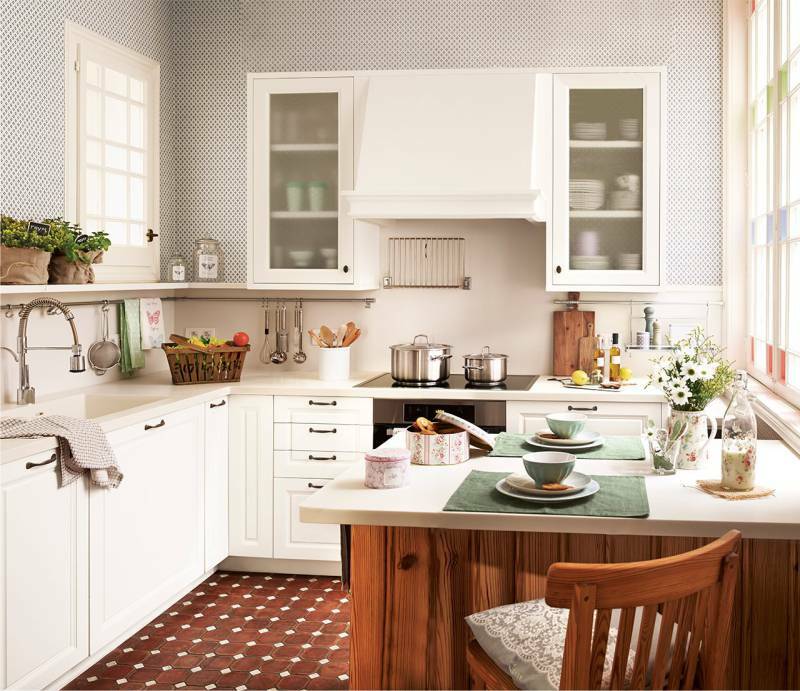 To visually “unload” the interior of a small square kitchen, you can leave one wall without hinged cabinetsor hang open shelves instead. 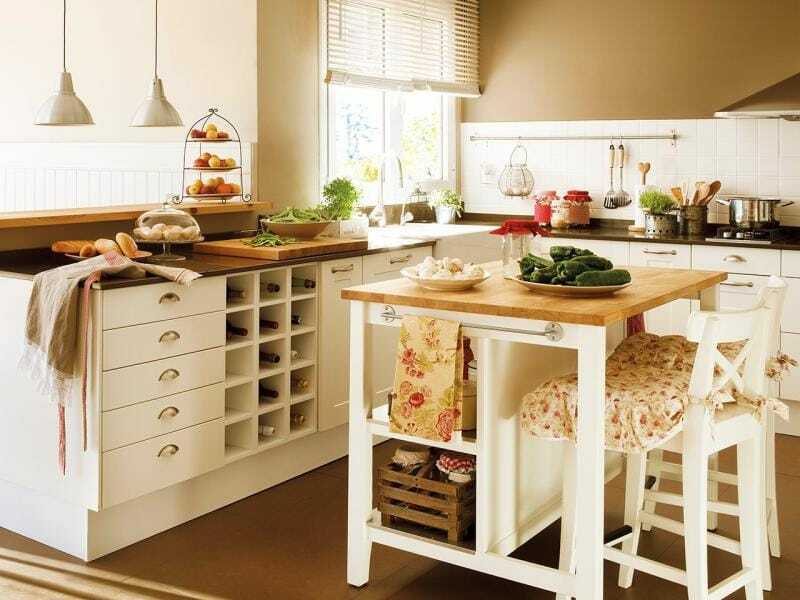 To equip the kitchen corner with a sink or stove, organize a workplace or a convenient storage cupboard in the corner. It is best to choose a headset with a trapezoidal corner module. 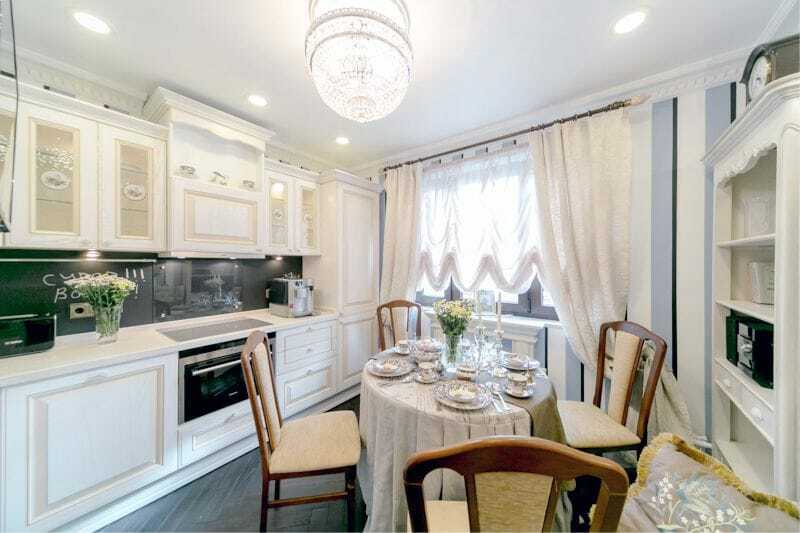 Next is an example of the design of a corner square kitchen area of ​​10.2 square meters. 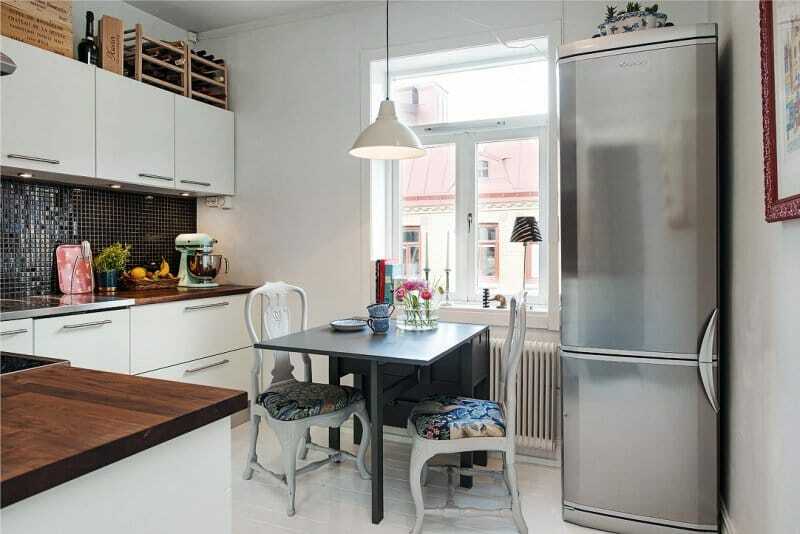 And here are a couple of examples of small square kitchens with a corner set. 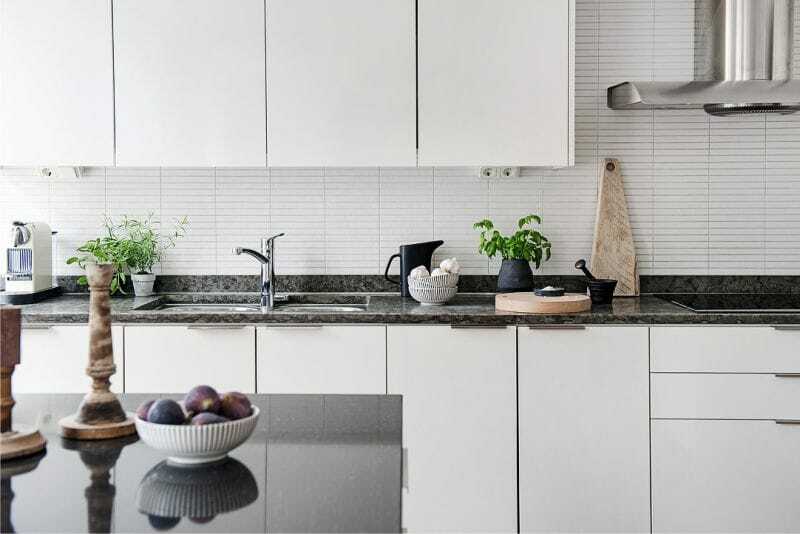 The U-shaped layout is another amazing option for a square-shaped kitchen. This concept uses three walls and two corners between them. 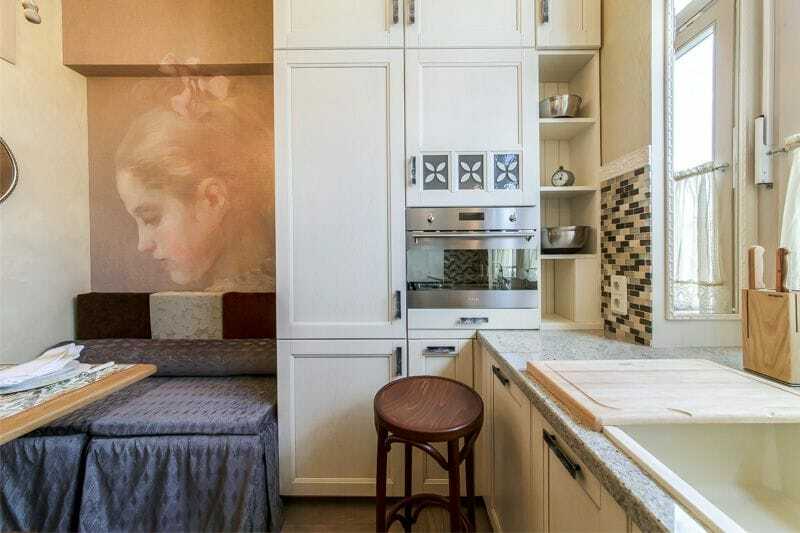 Pros: The main advantage is convenience, because the positioning of the work surfaces and lockers allow you to cook while making minimum moves. Creating this arrangement near the window makes it possible to wash dishes or cook while looking outside, and not at the wall, which is a better view. Cons: Not every square kitchen presents the opportunity to position kitchen furniture in a U-shape. For example, planning based on the U-shape may interfere with access to the balcony from one wall and the doorway from the other, as well as leaving an insufficiently small area. 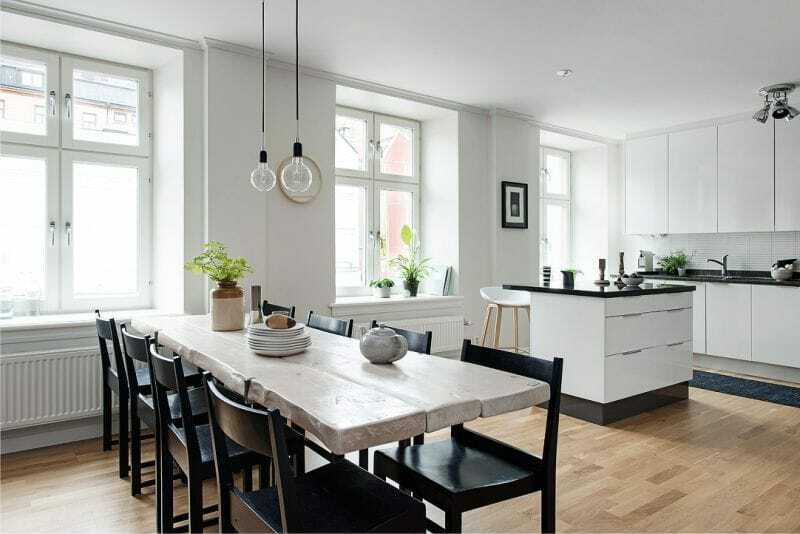 Theoretically, even in a kitchen of 3 by 3 m, a U-shaped arrangement of furniture is still possible.But then a fully-fledged dining area will have to be replaced by an elegant table for 2 persons or a bar counter. 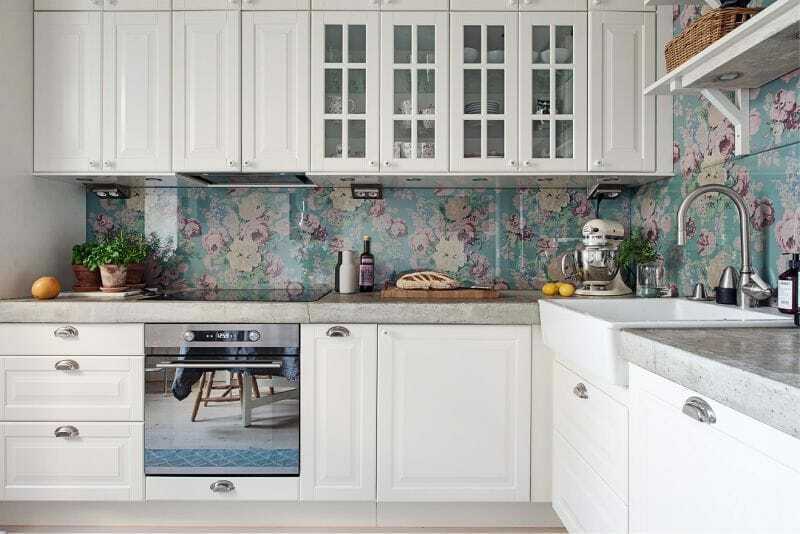 Passage between side cabinets should be not less than 120 cm (in extreme cases – 100 cm). 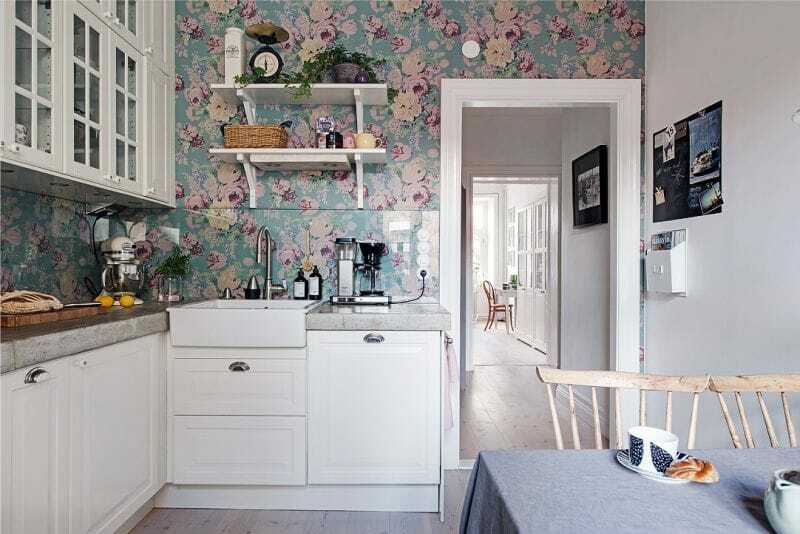 So the kitchen doesn’t appear cramped with furniture, the walls and facades of the headset should be selected in light colors, or even better, one color tone.The second way is to “unload” the interior – hang a pair of open shelves instead of hanging cabinets or even leave the wall empty. 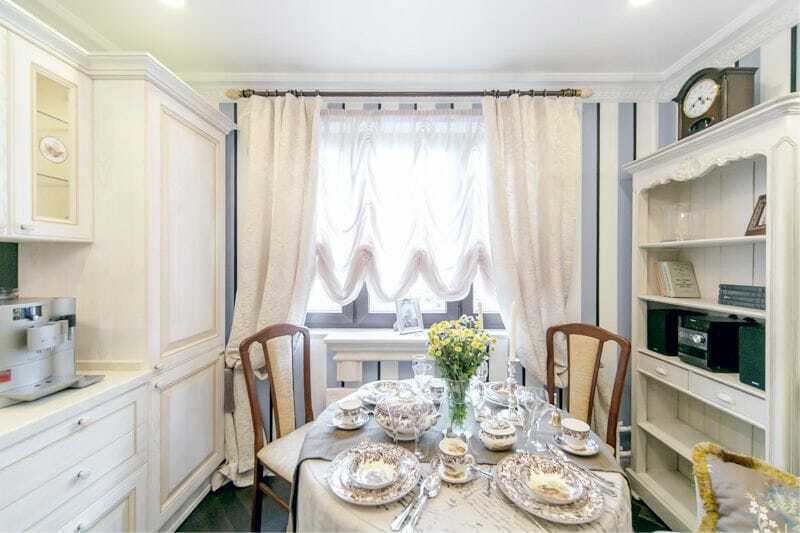 If the kitchen is not spacious enough but you would still like to accommodate a standard 4-seater table, the U-shaped set should be designed very compactly.For example, one of its sidewalls can be shorter. 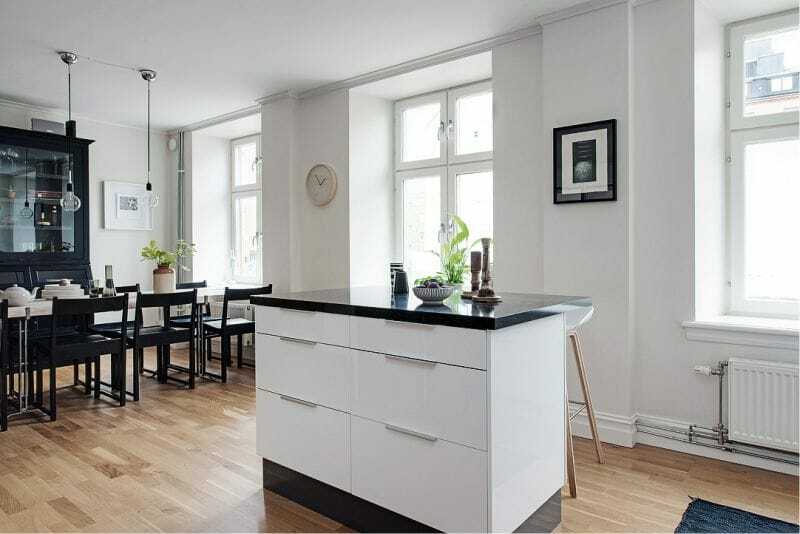 An example of a 3 × 3 m square kitchen design with a U-shaped layout is presented below (see!). This set is built in one or two rows, G or U-shaped can be supplemented with an island that is able to combine the functions of the bar counter and the working surface with the stove and / or sink (or without them). 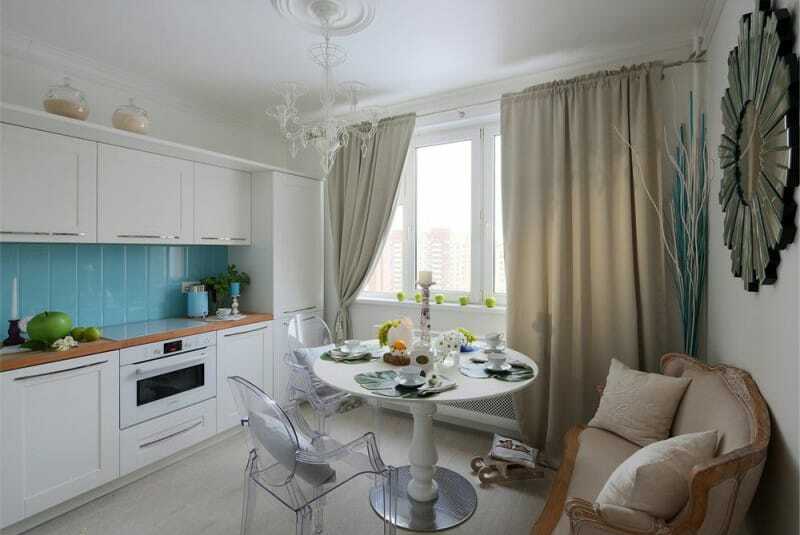 Spacious kitchens ranging from 20 square meters. 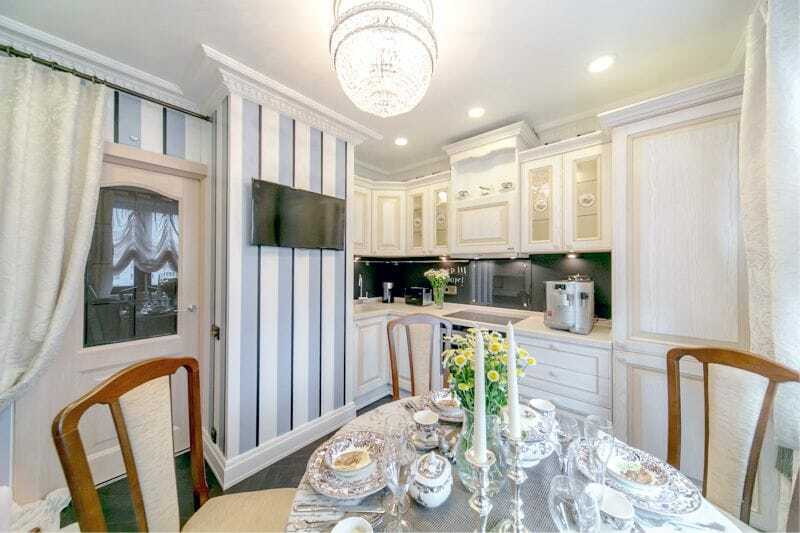 Kitchen-living rooms, when the dining area can be carried to the territory of the living room or to make the island not only a food preparation area, but also a dining table. “Working” kitchens, when the apartment has a separate dining room. 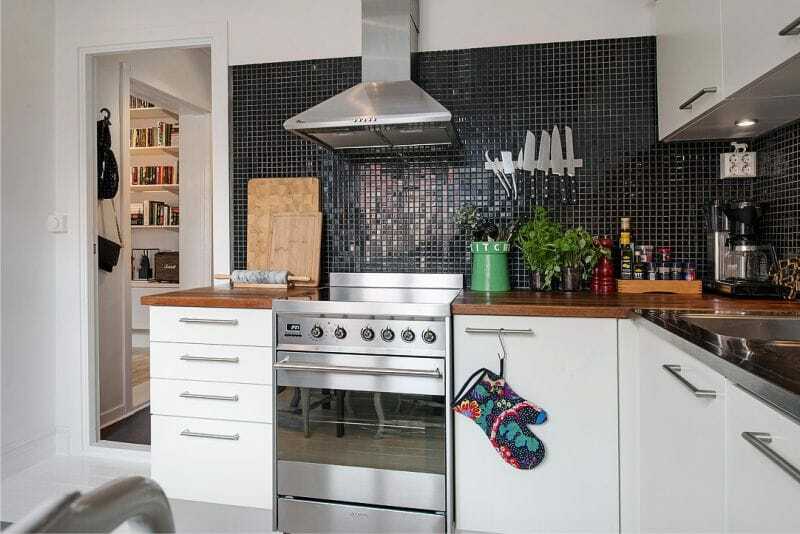 Pros: The kitchen with the island is comfortable like no other, because it allows you not only to build a “working triangle”, but also to remain open to communicate with the household or guests during cooking. Cons: To fit the island, a suite, and a full dining area in the kitchen, you need to have a kitchen area of ​​at least 20 square meters. In other cases, the island will either have to be done away with, or the dining area will only hold 2-4 people. 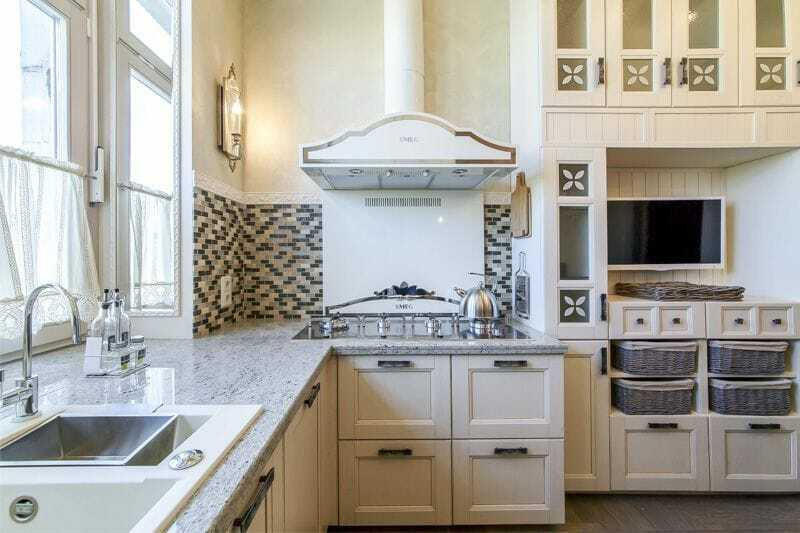 Another disadvantage of the island kitchen is the need for repair, which involves raising the floor level for the installation of a sink or stove. Particularly difficult tasks of repairing kitchens with islands are the transfer of gas stoves, exhaust channels and sinks. 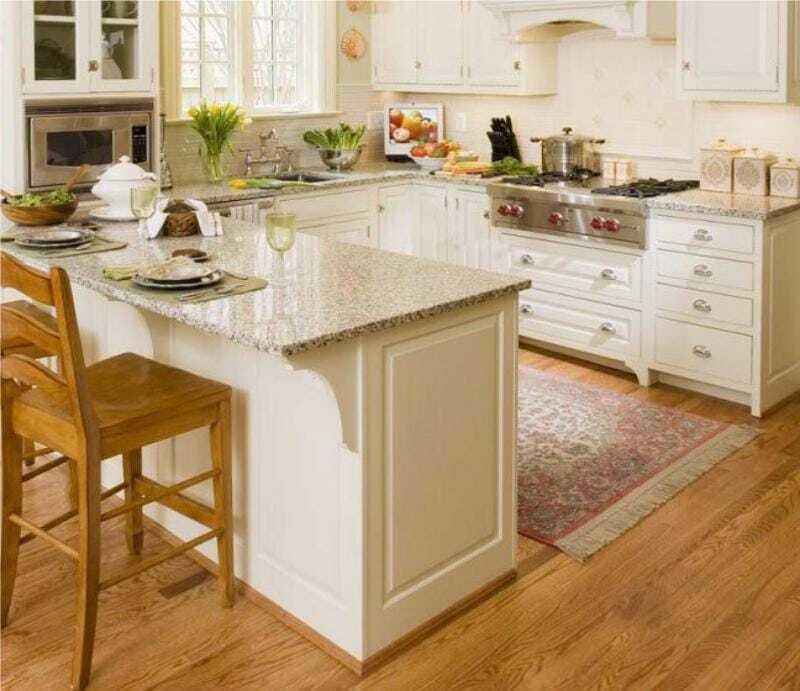 Typically, in a square kitchen, the island table should also be square as shown in the next photo compilation. The distance from the island to the headset or any other furniture should be at least 100 cm. In order not to complicate repairs, the island should be equipped with only an electric hob or a small refrigerator with a maximum capacity of 120 liters. 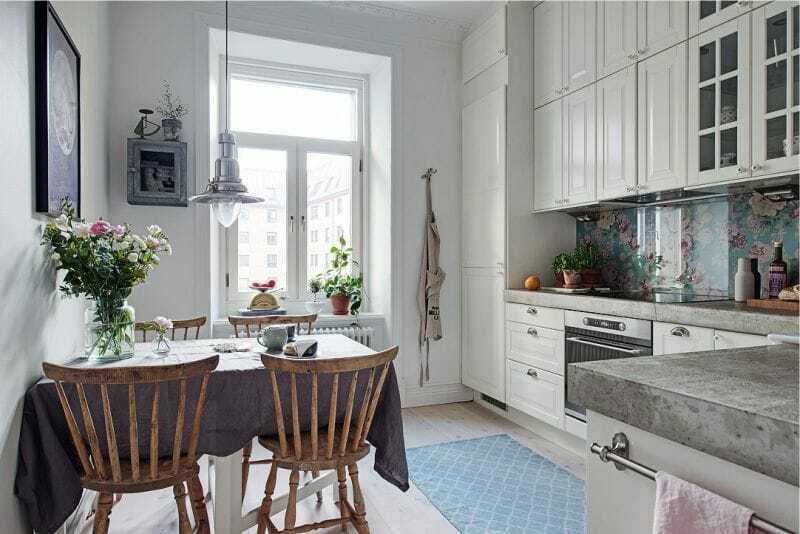 Details of the interior of a square kitchen with an island table can be seen in the next photo slide. 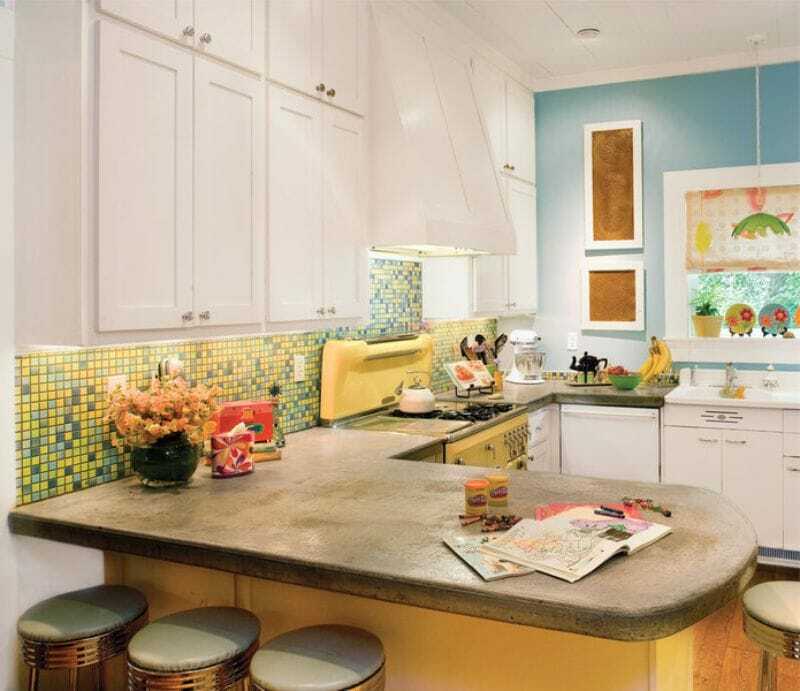 The kitchen with the peninsula is a more compact alternative to the island layout. Unlike the island, the peninsula can be leaned against the wall and / or the headset. 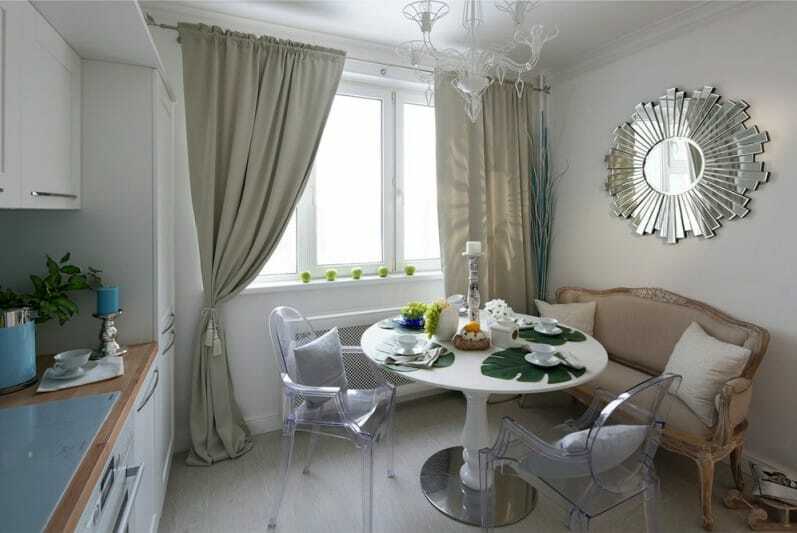 Small kitchens in which a dining table can be replaced by a peninsula table. 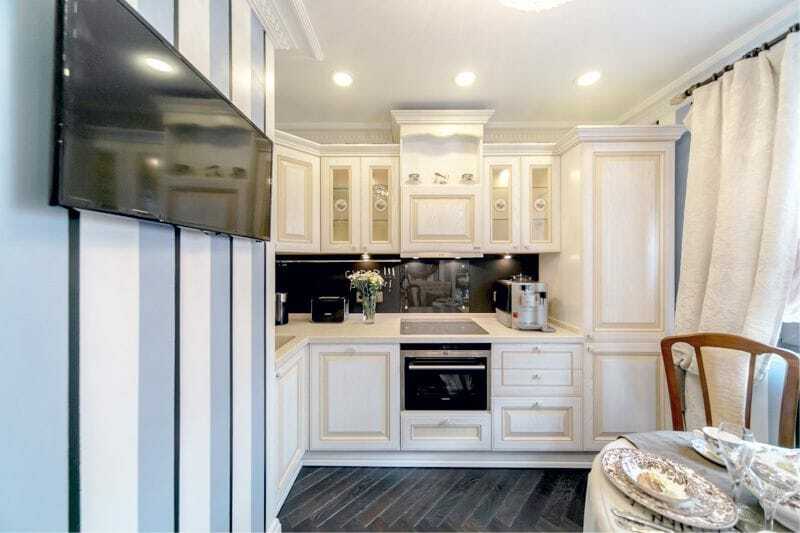 Kitchen-living rooms, where the dining area can be carried to the territory of the living room. “Working” kitchens, when the apartment has a dining room. 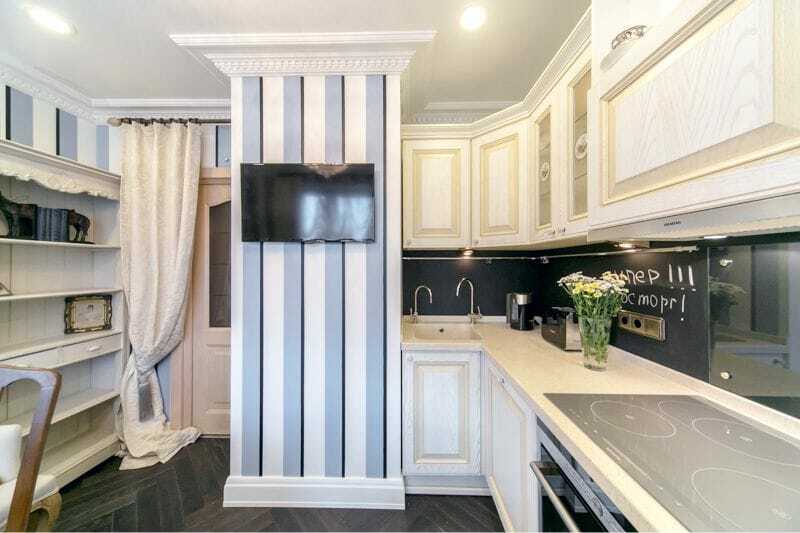 Pros: The kitchen with the peninsula is convenient for cooking and is more compact due to the fact that one side is leaning against the wall and / or the rest of the furniture. Cons: The peninsula slightly loses in the comfort of the island, as it cannot be avoided from all sides. 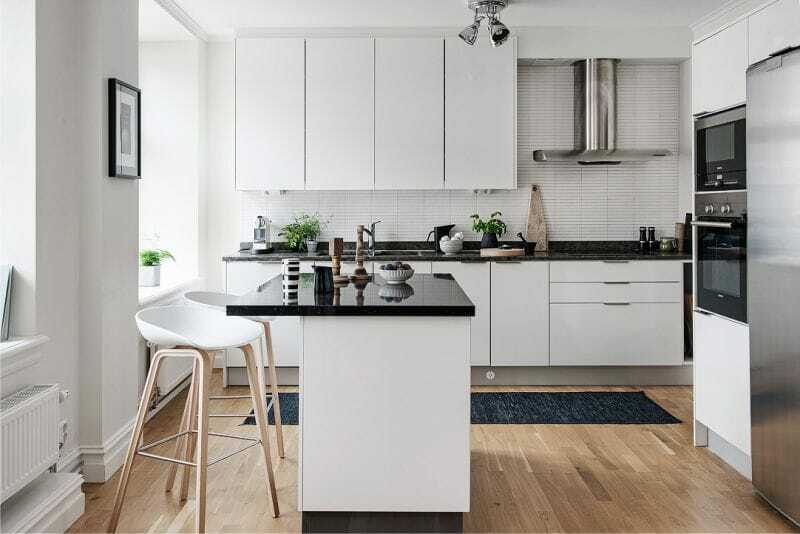 As a rule, the peninsula plays the role of both a countertop, a place for meals and a place for storing items, which means that it cannot fully replace the dining table either in capacity or in ease of use. With respect to the peninsula, the same recommendations as for the island table are relevant. 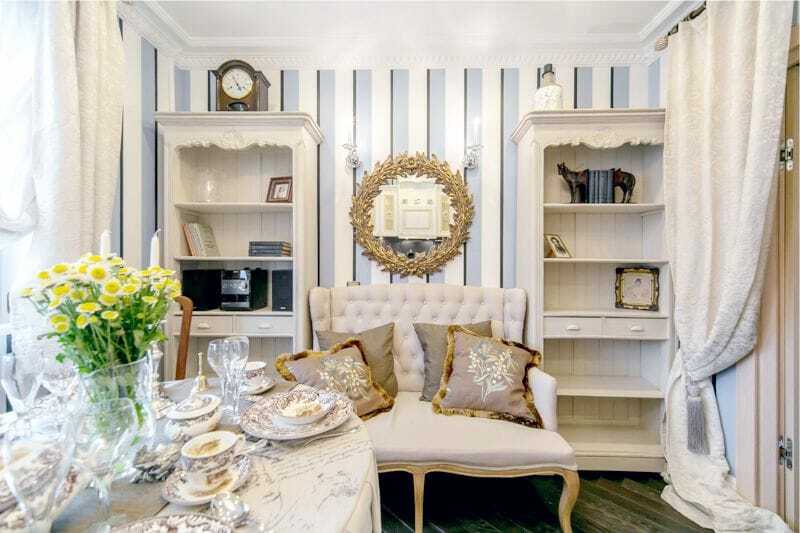 Here are some photo examples of interiors of square kitchens with peninsulas.